Over Due Theatre Company --- Through August 16, 2009! Reviewed by Mark Bretz The Wizard of Oz has been a perennial favorite of children since the classic movie first played the silver screen in 1939. For years, in fact, CBS would telecast the beloved family flick annually in February on a Sunday evening for new generations of tykes to revel in the adventures of Dorothy and her friends following the yellow brick road to Oz. That's before DVDs. Over Due Theatre Company last weekend opened its own presentation of the L. Frank Baum fable in conjunction with the Olivette Parks and Recreation Department. Seemingly as many people, primarily children, were on stage as the Munchkins who populated Munchkinland in the Land of Oz, all under the loving direction of Wayne Mackenberg. Mackenberg goes ambition a step further by directing a full-fledged version of the musical, including a staggering 27 scenes in its two acts, for Over Due's summer musical theater camp 2009 edition at Olivette. The 26 musical numbers include some that are just merely seconds or so long, as well as other lengthier renditions of time-honored classics written by Harold Arlen and E.Y. Harburg, such as "If I Only Had a Brain" and "We're Off to See the Wizard." Pianist Catherine Kopff's musical direction is handled off-stage behind a partition that maintains the fantasy effect for the tykes in the audience, while also providing accompaniment for the singers, assisted by percussionist Chris Brown and Jeremy Auch on synthesizer. Singers such as Katie Lynn McGowan, for example, who throws herself into Dorothy's big number, Over the Rainbow. In the Saturday evening performance Katie not only delivered her lines and tunes in showman like fashion but also contended with Gigi, the fun-loving canine who simply had a will of her own and as Toto was determined to steal every scene. Gigi was quite adept at generating laughs! Her human colleagues were committed to their roles as well. Tom Bell brought to mind the antics of Bert Lahr in the movie with his physical shtick as the Cowardly Lion, while Devon Norris and Mark Saunders were ingratiating as the Scarecrow and Tin Man, respectively. Tom Kopp brought his usual savvy to the roles of Professor Marvel and the Wizard, while Lori Gibson played up her status as the resident villains, Mrs. Gultch and the Wicked Witch of the West. Anne Marie McGowan had a fine time as Glinda, the Good Witch, while Debbie Bixler and Randy Masterson essayed the parts of Dorothy's Aunt Em and Uncle Henry. The dozens of children corralled by Mackenberg enjoyed themselves to the hilt, notwithstanding the claustrophobic effect of so many performers on the minuscule Olivette Community Center stage, getting into Anne Marie McGowan's choreography on the set designed by Mackenberg and Kopp. Augusta McGowan, Bixler, Mackenberg and Gibson deserve particular credit for designing the copious costumes adorning the lads and lasses as well as the major players. If you'd like to join the troupe on its trek along that colorful and magical road to Oz, the show is performed again at 8 p.m. on August 14 and 15 and at 2 p.m. on August 16 at the Olivette Community Center, 9723 Grandview Drive. For ticket information you may call 636-328-6546. The musical version of L. Frank Baum's timeless classic, The Wizard of Oz comes to life on stage at the Olivette Community Center as part of their Summer Theatre Camp 2009. Harold Arlen and E.Y. Harburg's tuneful score is given a nice workout by the Over Due Theatre Company, augmented by a vast ensemble of kids who portray the various munchkins, poppies, Winkies, monkeys and citizens of the Emerald City.By now almost everyone is familiar with the plot that follows Dorothy and her little dog Toto as their house takes a treacherous trip in a twister, only to touch down in the magical land of Oz. Dorothy's crash landing accidentally squashes the Wicked Witch of the East, drawing the ire of the Wicked Witch of the West. But, when she dons the dead witch's ruby slippers, she finds herself in even more trouble, since these were coveted by the Wicked Witch of the West, and can only be removed upon the wearer's death. On the advice of the munchkins, Dorothy journeys down the yellow brick road, seeking out the Wizard of Oz in the Emerald City to see if he can help her get back home, while managing to meet up with the Cowardly Lion, the Tin Man, and the Scarecrow. 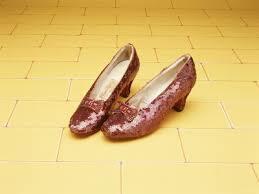 Together they defeat the Wicked Witch, and Dorothy returns to Kansas, a bit wiser for her travels and travails. Katie Lynn McGowan is a nice fit as Dorothy, and she handles the signature tune, "Somewhere Over the Rainbow" with aplomb. She's aided in her quest by: Devon Norris, neatly limber-legged as the Scarecrow; Thom Bell, channeling the spirit of the late Bert Lahr as the Cowardly Lion; and Mark Saunders as the Tin Man. Canine actress Gigi steals every scene she's in as the irrepressibly cute Toto. Tom Kopp delivers a nice turn as Professor Marvel and the Wizard, and Anne Marie McGowan shimmers as Glinda, the good witch. Lori Gibson is properly villainous as the Wicked Witch/Almyra Gultch. Director Wayne Mackenberg has a lot of adults and children to corral on the small stage at the Olivette Community Center, and it's to his credit that the action is clear and easy to follow. Mackenberg is also presenting a complete version of the show, with songs, characters, and lines of dialog that have been missing from most revivals. It's certainly an ambitious undertaking, and he's aided in his efforts by Catherine Edwards Kopf's music direction. Anne McGowan and Devon Norris do a good job of choreographing these numbers despite the cramped confines. Augusta McGowan, Debbie Bixler, Wayne Mackenberg and Lori Gibson also contribute to the vivid, and plentiful, costumes.Over Due Theatre Company's presentation of The Wizard of Oz continues through August 16, 2009 at the Olivette Community Center.